3888 Ways of the Dragon is one of newest online slot game of 5 reels and 3,888 paylines powered by iSoftbet Gaming. 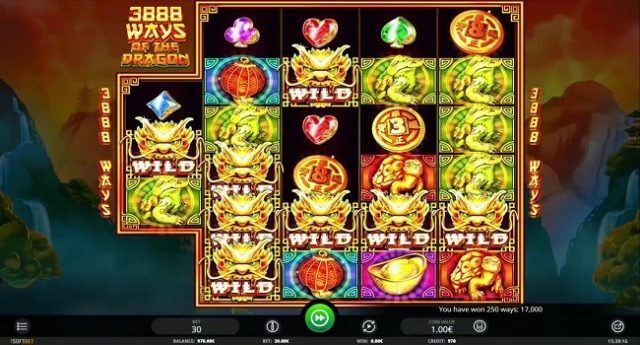 The game has special symbols like magical dragons, which if appears can add up to 8 extra wilds and could award you anywhere between 8 to 18 free spins. This slot is playable at devices like tablets, smart phones or desktops with coin sizes of 30p per spin to up to €£30 per spin. The game has 2 bonus rounds. One of them is already mentioned i.e. the free spin feature which would give you 8 to 18 free spins and another is Dragon Spins feature. This is a bit unusual video slot game for which reel 1 includes just 3 symbols and rest of the reels of the game contains 6 symbols and that is why they offer 3,888 ways of winning combination, which is so very nice for a player like you, who would always want to play at bigger and better payline slot games. 3,888 Ways of the Dragon is a very nice looking and attractive mobile video slot game, where you would find traditional buildings, waterfall and mountains in the background. Symbols such as clubs, spades, hearts and diamonds can be found at this game as well as 3 and 8 coins joined with a bowl, a tortoise and a lantern. The fat frog is the highest paying symbol of this Chinese themed slot machine which would give you 20,50 or 100 coins if you land 3,4 or 5 of these symbols on your payline. Dragon Spins feature – This feature comes in action, when a golden dragon comes in to life and flies across the reels by giving you 2 and 8 extra wilds. Free Spins feature – If you land 3 scatters or more scatters symbols on a single spin then this feature is triggered and in that case you will receive 8 to 18 free spin. This is a very classic slot which allows you to win a whooping 12,960 times of your total stake per spin or per free spin. This slot can be a game-changer for you. So if you want to take a look at this beautifully managed slot game then you can check out at any of below sites or go for best online casinos isoftbet.